I AM NOT PREPARED! Wait that was two Expansions Ago. I’ll freely admit I am not anywhere near the level of doing all I can do to be ready to tank heroics. I am missing enchants left and right. I do have gems that are appropriate, but some of my gear is still clearly more DPSy than Tanky. That is just the result of still working my way through rep grinds and quest rewards. So last night I tanked Halls of Origination with Wookie and Lizard. Lizard is an enchancement Shammy who is 84 (avg ilvl 314 after last night). Wookie playing his level 85 Warlock(avg ilvl 319). We queue up for a pug choosing that instance because it has lots of bosses and therefore can be a bit of a loot pinata if you make good time. Overall the problems I complained about in my last warrior post seemed almost reversed. I will say my group was really good about skull then X and CCing when directed. I played the bossy tank because I find it is helpful to be assertive. to get pugs rolling well. My threat generation seemed to be no problem, even on pulls where we had several mobs and couldn’t get CC right. On bosses the threat lead I got was really quick and just got bigger and bigger. In fact my threat lead got so large I started slacking on it opting to address the other main problem, namely survivability. It seemed our Shaman healer was constantly running out of mana about 50%-67% through the boss fights. By this point I had a serious threat lead and would hover over cooldowns in case I dipped into uncomfortable health land. I know healer mana is a much bigger problem this expansion than last, but it was pretty difficult for me to tell if the problem was the healer trying to do too much and spreading himself thin, or me being too much of a mana sponge and forcing the mana issues, or was it the DPS underperforming making fights last way too long for the healers mana pool. Probably it was a blend of these three. Some of the issues will be solved with gear over time, and some of it will be solved with people learning to play their roles better. In case anyone is wondering how I chose abilities to get threat. I know it isn’t the ideal priority, but I used this as the base idea and tweaked it based on situation. For example on trash pulls I weaved shockwave in there to maintain AoE and used cleave over heroic strike, on boss fights I move rend down into the mix favoring a quick revenge/shield slam to start. This isn’t intended to be a chart on the ideal Threat Gen method. There are too many variables in tanking to do anything ideal all the time. This if anything is a blend of survivability and threat. Obviously you need to throw in interrupts when you need to, to prevent unnecessary pain and suffering on yourself and your party. Warning: This is a general approximation of a tanking priority flowchart. There is a distinct difference in AoE vs Single Target tanking, and tanks should be able to understand the difference. I generally Battle/Comm Shout before the pull to generate some rage before I head in. But yeah, it’s all about survivability once you get past the first few seconds of the pull. Early threat is the problem, snatching that first bit of snap aggro to yourself instead of the DPS. Once you’re getting hit you’re building vengeance stacks and threat stops being a problem. I like your Revenge/Slam/Sunder priority approach. I think my after pull using the battle/command shout is probably a legacy habit from when it cost rage rather than made rage. Also I will refresh as soon as I can to make more rage (assuming it wouldn’t rage cap me) figuring it is better to be in the 50-75 rage area than ever find myself rage starved. And that kind of nuance is not easily flow charted. But yeah vengeance is awesome. I love it. As a dps’er through all of this expansion so far, I have noticed that good tanks do a great job of initial threat generation. If I do not have MD up, I usually lead with a DoT, to let the tank have another GCD or so to build up that threat, but most tanks have done a good job with it. Next time I am on, which may be awhile, I can hit you up with some leatherworking enchants (legs and armor kits). When I level my tank, I almost exclusively rely on those, since they are cheap for me and give a ton of stam. I’m also seeing a lot of theorycrafting in the tanking community that because of healer mana as a limiting factor, the Effective Health model of Wrath is Effectively Dead as a way to value stats. Once we have “enough” health to eat a raid boss’s unavoidable high-damage hits with a comfortable margin for healers, stacking more and more health mostly turns us into expensive mana sponges. Mastery and avoidance, after whatever that point is (I’ve seen 150k unbuffed, but that seems fairly arbitrary), are now king. I’m still in that awkward, pimple faced, cracking voice, teenage like phase of gearing up. I’m almost done with all the Cata Quests so I have all possible quest blues. I’ve got a few blues from regular lvl 85 dungeons, and a justice piece. 150k seems like a reasonable point to start stacking up on avoidance over health, but I won’t know how that feels until I get that far. Oh yeah, I picked that up from the post. Just adding experience with more gear; threat is still far less an issue than surviving even when you’re not in half greens. I’m not at my unbuffed health goal either and I’m already getting a distinct feel with more avoidance. You are using very few of your survival cool downs in your rotation. Shock wave–stunning anything stunnable in front of you. Shock wave is either the very first cool down after charge (if the mobs look like they will be caught in it) or the 3rd–after rend and thunder clap. Shield wall is on a 2 minute cool down. Fast enough that you can probably use it on every other or every third pull. Probably twice in most boss fights–especially if you burn shield wall early. Enraged Eegen and Last Stand are both 3 minute cool downs–and should be used together when possible. A hot for 65 or 70k over 12 seconds? Huge. Intimidating Shout–if you have the minor glyph its an 8 second CC on 5 mobs, rooting them in place, usable every 2 minutes. Use it early on large, nasty pulls. Victory Rush–My prot warrior is specced and glyphed for Victory Rush (enduring victory, impending victory, and the healing increases in the arms tree). Impending victory is “only” a 5% heal–unspecced–but even that can be the size of a regular, slow, efficient heal for your healer. A Victory Rush on kill is a monster 30k+ heal that can save wipes, easily. Tanking isn’t just threat in early cata–it isn’t even mostly threat. Its making sure your healers don’t run out of mana. Well the reason is that the flowchart is the default. 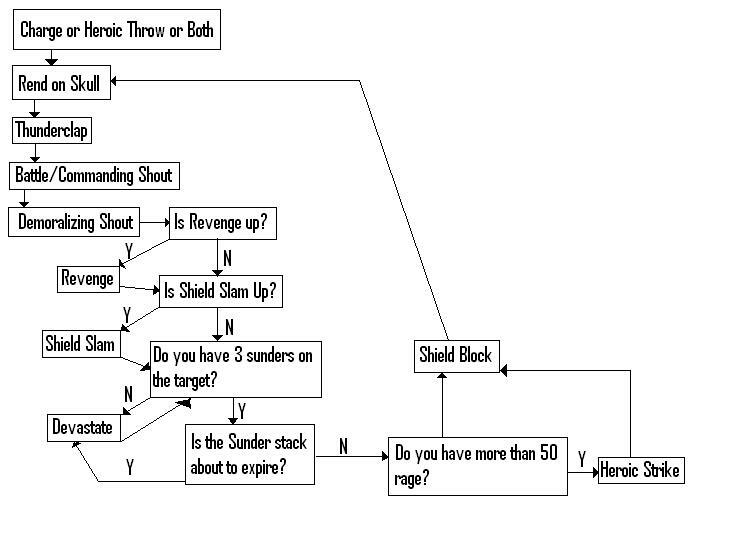 I am firmly in the camp that most survival cooldowns/interrupts aren’t easily charted into a flowchart. They need to be timed for maximum usage. I will scream from the mountain tops that survival trumps threat always. ALWAYS. ALWAYS! But when not doing survival things (and I lump interrupts into survival things) you should work on building threat and that was the focus of this particular post. I appreciate the comment, and hope minus the survival techniques you do find it useful.